1. Combine all the ingredients of the batter and make a medium thick batter . It should not be too thick or too thin . Pour the batter in a ketchup bottle( the one with nozzle) and keep that on a bowl covered with hot water. Just pour half of the bottle . Leave it there for half n hour or until the batter rises up to top of the bottle . 2. In the mean time make the sugar syrup using the ingredients , mentioned above . Make a medium thick syrap . it should not be thin . Keep the syrup on low flame. 3. Heat oil and squeeze the batter into the oil into coil-like circular motion . Fry until brown . Transfer immediately to the sugar syrap and let the jilapis sit in the syrup for 1 minute or so .Remove it from syrup and serve hot !!!!!!!! 1. You may add 1 teaspoon ghee to the syrup to get that Authentic ” ghee e bhaja Jilap” flavor. 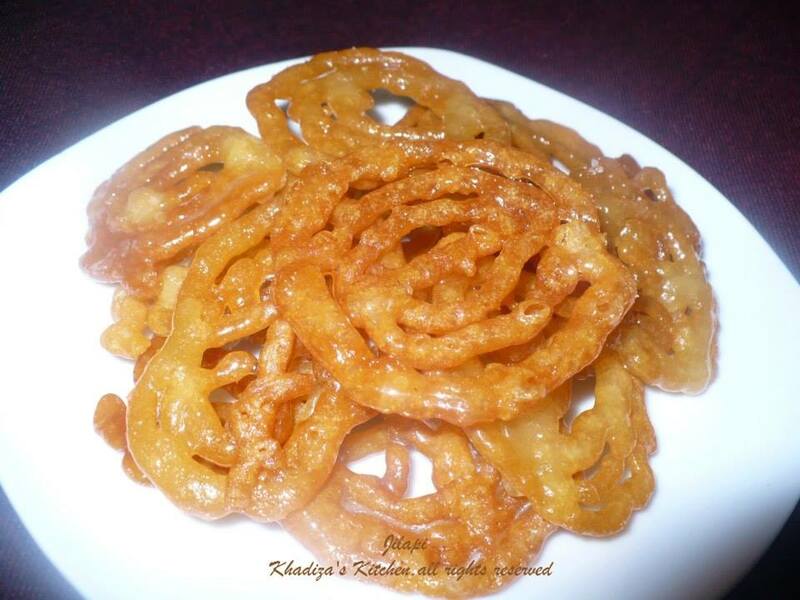 This entry was posted in Bangladeshi Sweets / Mishti, Desserts, Glossary / Notes and tagged Jalebi recipe, Jelebi recipe, Jilapi recipe. Bookmark the permalink. 🙂 all the best !!!!!!!!! apu batter ki protiber half bottel vore hot water bowl e rakhte hobe. Ai step ta ektu clear kore den. Apu, lukewarm water er amount ta ektu bole den. Mota mota jilapi korte holee ki dispenser use korbo?